Voodoo Lab Voodoo Lab Pedal Power Digital <img src="https://stompin-ground.com/pics/made-in-usa.jpg" alt="Made in USA" /> Free options include: • Velcro Hook fastener installed on bottom • Your choice of power cables Additional options too! If ordering multiples of this item, add them to the cart 0 at a time. Pedal Power Digital is a linear (analog) power supply for high-current DSP-based pedal effects and accessories. With 4 completely isolated, filtered, and regulated output sections, Pedal Power Digital keeps your pedals dead quiet and free from high-frequency noise that occurs with digital “switching” power supplies. Pedal Power Digital will properly power up to 4 digital power-hungry effects like those from Strymon, Eventide, Line 6, TC Electronic and more. Its compact size is perfect for small pedalboards, rack shelves, and as an additional power supply for larger boards. Built to meet the needs of professional users, Pedal Power Digital will provide clean, consistent power, even under the poor AC line conditions often found on stage. Completely isolated output sections eliminate ground loops and unwanted interactions between effects, resulting in lower noise and noticeably improved tone. Isolated power specifically designed to make digital pedals sound their best. Every output on Pedal Power Digital is individually short-circuit protected. This means that if you have a short in a power cable, or one of your pedals malfunctions, the Digital will turn off the power to only that pedal. All other outputs will continue to function normally without long-term damage. Input: Detachable IEC (computer-type) line cord. 120V 50/60Hz (North America model). Physical: 4.9″ wide x 3.4″ deep x 1.8″ tall (124 x 86 x 44 mm). Weight: 1.6 lbs. Important: Pedal Power Digital is manufactured to operate from a specific supply voltage. There are three different models, which accept 100V, 120V, or 240V mains. All units sold in North America are for 120V only. You cannot operate a 120V model using 240V power without the correct step down transformer. The supply voltage is marked on the bottom of the unit. You may order your power supply with the default cable package or choose from a customized list of your preferences. Below is a list of all the stock cables included. Specifications may change without notice. Four (4) 5.5mm x 2.1mm barrel plugs, right angle on both ends, 18″ long. Four (4) 5.5mm x 2.5mm right angle barrel plug on one end (reversed polarity for Line 6 modeling pedals) and a 5.5mm x 2.1mm right angle barrel plug on the other end, 18″ long. 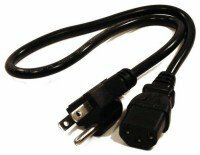 One (1) Detachable IEC power cord, 6′ long. Please note: This picture shows a shorter 3′ length and is for reference only. Six feet long is standard.